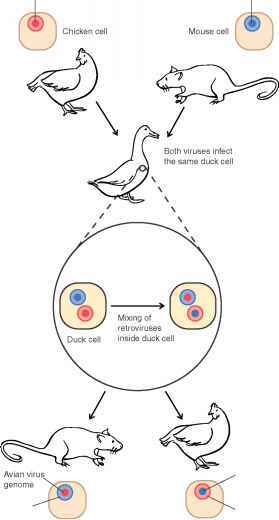 Gene transfer can occur in many Gram-positive and Gram-negative bacteria by DNA-mediated transformation in which DNA is released from some cells and is taken up by other cells, termed competent for DNA uptake. Competent cells have undergone a number of changes which allow them to bind DNA, take DNA into the cell in a single-stranded form and integrate the DNA. Artificial means such as electroporation can be used to get DNA into cells. ■ What effect would adding deoxyribonuclease to the culture have on transformation? ■ If cells do not become naturally competent, can they still be made to take up DNA? Explain. ■ Could you devise a test using DNA-mediated transformation that could test chemicals for their mutagenic activity? In the 1930s, it was well known that DNA occurred in all cells, including bacteria. Its function, however, was a mystery. Since DNA consisted of only four repeating subunits, most scientists believed that it could not be a very important molecule. Its important biological role in the cell was discovered through a series of experiments conducted during a 20-year period by scientists in England and the United States. In the 1920s, Frederick Griffith, an English bacteriologist, was studying pneumococci, the bacteria that cause pneumonia. It was known that pneumococci could cause this disease only if they made a polysaccharide capsule. In trying to understand the role of this capsule in the disease, Griffith killed encapsulated pneumococci and mixed them with living mutant pneumococci that could not synthesize a polysaccharide capsule.When he inoculated this mixture of organisms into mice, much to his surprise, they developed pneumonia and died (figure 1). Griffith isolated living encapsulated pneumococci from the dead mice.When he injected the killed encapsulated organisms and living non-encapsulated organisms into separate mice, they did not develop pneumonia. Two years after Griffith reported these findings, another investigator, M. H. Dawson, lysed heat-killed encapsulated pneumococci and passed the suspension of ruptured cells through a very fine filter, through which only the cytoplasmic contents of the bacteria could pass.When he mixed the filtrate (the material passing through the filter) with living bacteria that were unable to make a capsule, some of these bacteria gained the ability to synthesize a capsule. Moreover, these bacteria passed on this ability to all of their offspring. Something in the filtrate was "transforming''the harmless, unencapsulated bacteria into bacteria with the ability to make a capsule. What was this transforming principle? In 1944, after years of painstaking chemical analyses of lysates capable of transforming pneumococci, three investigators from the Rockefeller Institute, Oswald T.Avery, Colin MacLeod, and Maclyn McCarty, submitted one of the most important papers ever published in biology. In it, they reported that the molecule that could change (transform) a cell's properties was DNA.